THE HEAVENS—Following a 8-7 victory over the Cleveland Indians that clinched the team’s first World Series title since 1908, sources confirmed Wednesday that millions of intoxicated Chicago Cubs fans are currently rioting across Heaven. Moments after watching the game’s final out from above Earth, massive throngs of intoxicated Cubs fans—most of whom went their entire lives without ever seeing the team win a World Series—poured out all over the eternal city, where they reportedly continued drinking heavily as they cheered, hugged strangers, and loudly played golden harps in celebration of their long-awaited championship. “Woo!” continued Leitch as she drunkenly stumbled over her feet and broke out in a fit of laughter. 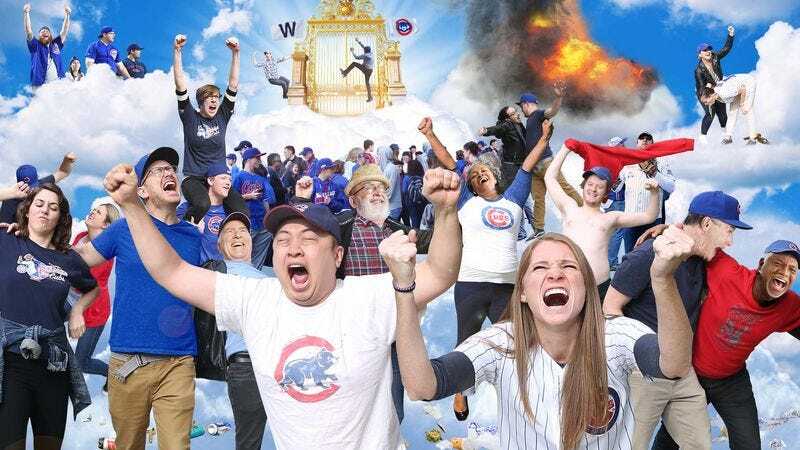 According to reports, after one fan managed to affix a large “W” win flag to the top of the Pearly Gates, a large mob of Cubs fans began violently shaking the gateway as they chanted third baseman Kris Bryant’s name for nearly an hour. Sources confirmed that the gold-paved streets were quickly littered with empty beer cans, cigarettes, spilled food, and other refuse, while a number of inebriated fans were also seen urinating against the sapphire, emerald, and diamond–encrusted walls that protect the sacred realm. In addition to firing a slew of Roman candles upwards into infinity, a pack of belligerent fans reportedly succeeded in rocking the Throne of God back and forth until the seat of the Almighty Father tipped over onto the ground, after which several men and women began jumping up and down atop it. Many witnesses also reported seeing at least one fan hunched over and vomiting over the side of a cloud. Some of the festivities reportedly began getting out of hand when a group of Cubs fans lit the Ladder of Divine Ascent on fire, and shortly thereafter, several teenagers dumped an entire pitcher of beer on the head of an archangel as he attempted to fly through the raucous crowds. Numerous men were later seen stripping off their shimmering Heavenly robes and streaking through God’s Kingdom. However, reports also confirmed that dozens of small children were celebrating peacefully while sitting on the shoulders of their parents or grandparents, with many wearing youth Cubs jerseys bearing the names and numbers of Ron Santo, Billy Williams, Ryne Sandberg, and Jake Arrieta. According to sources, the championship celebrations are expected to continue for much of eternity. At press time, sources within Heaven confirmed that hundreds of disorderly Cubs fans had been apprehended and sent to Hell.